My son is literally obsessed with anything with wheels! He has always been like this pretty much his whole life, even as a small baby. So when putting together our activities for the activity sticks I knew it would be fun to add something car related. So in the motor development category we added a tape road activity and that stick was drawn recently and my kids loved it! All you need for the tape road activity is tape. This is one of my favorite things about this activity, all you need is tape (and a few cars of course). Almost anybody can find some kind of tape laying around their house. I was able to find two different kinds. First I used some glitter tape and once that was gone I finished with some masking tape. It isn’t the prettiest road but my kids didn’t mind. I even ended up letting them color the masking tape (this can be dangerous to let them do while the tape is still on the floor, well dangerous for the floor). Once you have the tape you can start building your road. This was easy and could be something you let your children help with. We ended up making a small and simple road with a couple turns. I have however seen a lot of tape roads online that take over the whole kitchen or a whole wall. There is really an endless amount of possibilities when it comes to the building of your road. Once you are done building it is time to play. We pulled out a couple cars for each of my children and we started to play. 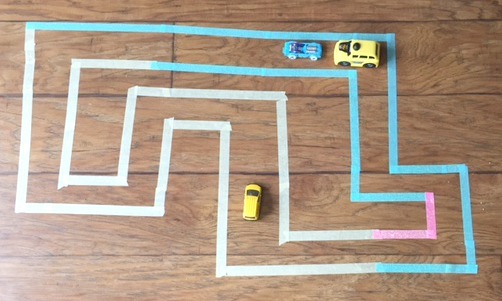 They had a lot of fun racing their cars around the tape road and making up their own “rules of the road”. Another great thing about this activity is the clean up. This is something your kids can even do! All you need to do is pull up the tape and it is done and no mess is left behind. My kids loved this part of the activity as well, maybe even more than playing with the cars. 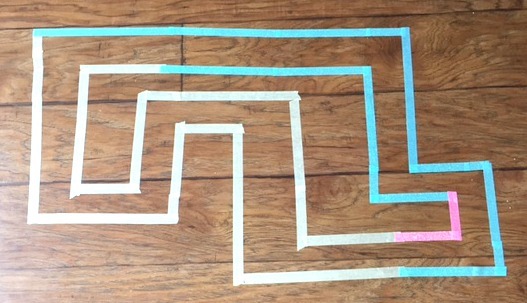 Who do you know who would love to play with a tape road? How would you make yours unique? Let us know in the comments below!